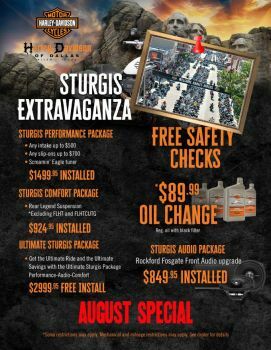 Home › Promotions › Sturgis Extravaganza! Harley-Davidson® is the official sponsor of the motorcycle event and we're celebrating with FREE SAFETY CHECKS AND $89.99 OIL CHANGES! Get your bike ready whether you're riding the Black Hills or the Black streets of Dallas with our August service special! Get the Rockford Fosgate Front Audio upgrade for $849.95 installed. Or Combine Packages for the Ultimate Ride. Schedule motorcycle service near Dallas today.